Don’t let your hotel be the one that sticks with some new piece of technology because it is trendy. Before implementation, learn how it can be beneficial to you and what it can bring to your door. The latest new eBook titled Your hotel in one App: An actionable guide to boost your sales and service with hotel mobile application, gives hoteliers advice on how to get the most from a mobile app in a step by step process. • Prepare and configure your mobile application. • Influence your guests to use your mobile application. • Use the application for marketing, sales and customer service. • Serve your guests in real time. 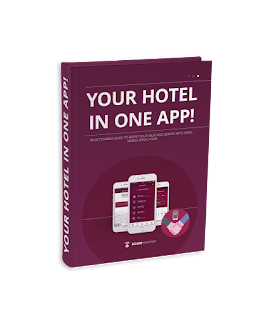 If you think about having hotel mobile application and are not sure how to use its full potential, download this free eBook and be the mobile app rockstar!